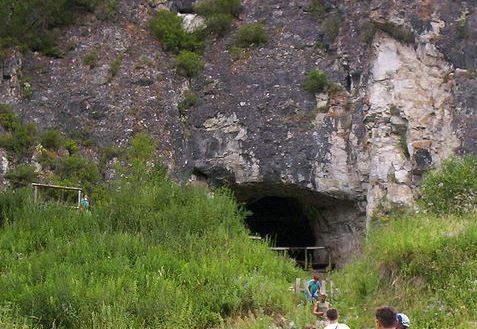 Recently, a Neanderthal toe bone yielded enough DNA to sequence the full genome of the woman whose remains were found in the Denisova Cave in the Altai Mountains, shown above. This information was published in the Journal Nature in an article titled “The complete genome sequence of a Neanderthal from the Altai Mountains” by Prufer et al. I wrote about what was found here, but it wasn’t until I really read the 200+ pages of supplemental information that I found additional buried information. The article itself talks about some of the findings relative to Native Americans, but the supplemental information provides additional detail and the supporting charts. In the paper, the Mixe and the Karitiana people of Mexico and Brazil, respectively were most often used to represent Native Americans. There are about 90,000 Mixe language speakers alive today, so their population is not small. However, the Karitiana are just the opposite, with only about 320 people in a very remote region of Brazil. The Karitiana shun contact with outsiders. In some parts of this study, additional population groups were used for additional Native samples. Here’s what the article itself has to say about Neanderthals, Denisovans and Native Americans. We used the two high-coverage archaic genomes and a hidden Markov model (HMM) to identify regions of specifically Neanderthal and specifically Denisovan ancestry in 13 experimentally phased present-day human genomes (Supplementary Information sections 4 and 13). In the Sardinian and French genomes from Europe we find genomic regions of Neanderthal origin and few or no regions of Denisovan origin. In contrast, in the Han Chinese, the Dai in southern China, and the Karitiana and Mixe in the Americas, we find, in addition to regions of Neanderthal origin, regions that are consistent with being of Denisovan origin (Zscore54.3 excess relative to the Europeans) (Supplementary Information section 13), in agreement with previous analysis based on low-coverage archaic genomes. These regions are also more closely related to the Denisova genome than the few regions identified in Europeans (Supplementary Information section 13). We estimate that the Denisovan contribution to mainland Asian and Native American populations is ,0.2% and thus about 25 times smaller than the Denisovan contribution to populations in Papua New Guinea and Australia. The failure to detect any larger Denisovan contribution in the genome of a 40,000-year-old modern human from the Beijing area suggests that any Denisovan contribution to modern humans in mainland Asia was always quantitatively small. In fact, we cannot, at the moment, exclude that the Denisovan contribution to people across mainland Asia is owing to gene flow from ancestors of present-day people in Oceania after they mixed with Denisovans. We also note that in addition to this Denisovan contribution, the genomes of the populations in Asia and America appear to contain more regions of Neanderthal origin than populations in Europe (Supplementary Information sections 13 and 14). The fascinating part of this, aside from the fact that Native people also carry both Denisovan and Neanderthal DNA, and that they carry more than Europeans, is that the Denisovan and Neanderthal DNA that they carry is different than that carried by Europeans. In fact, it appears that not all Europeans carry Denisovan DNA and this paper lowers the estimated percentage of Neanderthal for all Europeans. This difference in the Neanderthal and Denisovan DNA might be able to help solve a long-standing mystery, and that’s whether or not part of the Native population of the Eastern seaboard, and in particular, the far Northeast part of that region, was populated by or admixed with Europeans long before the time of Columbus and other European pre-colonial explorers. This information, of course would have to come from pre-contact burials, but they do exist and with this new information in hand, they might just yield answers never before available. “Researchers determine the degree to which a mutant gene differs from the most common sequence (wild type), then impose a time scale in the form of known mutation rates. The SLC16A11 five-site haplotype is so divergent that it goes back to nearly 800,000 years ago — before our ancestors expanded out of Africa. And so, it seems that the Native American people today indeed inherited their propensity for type 2 diabetes from their ancient Neanderthal ancestors who lived in the Altai Mountains. It also appears that this genetic predisposition did not carry forward to Europe, if indeed this group of Neanderthals was ancestral to Europeans at all. This entry was posted in Archaic Humans, Denisova, Native American, Neanderthal and tagged General Information by Roberta Estes. Bookmark the permalink. My own take is that the further back we are able to test, the more complex the interrelationships between different groups. It truly is an exciting time for this science. Why don’t they do more DNA results on the 7,000 year old Windover Bog mummies from Brevard County, Florida? Some people say that a few of the mummies had some European mtDNA markers? DNA science was in its infancy when the mummies were discovered yet they were able to analyze the DNA at the time because it was so well preserved. They could do so much more with the DNA now. Barry Sykes in his book, DNA USA, even said that the mummies should be studied more. I certainly hope they do more DNA on all of the ancient remains they have tested to date. Why don’t we ever hear about Queen Puabi and the test of her DNA, supposedly part Annunaki? I have a copy of that book but haven’t finished it yet. I can see if we have a large natural disaster how we could lose a lot of our technological development. C A Beverforden, technological development can be lost through war and political upheaval as easily as through natural disaster. Look at what happened when Rome deteriorated and was conquered the first few hundred years after the death of Christ. Europe was plunged into nearly 1,000 years of intellectual darkness. This is what I refer to. Is the smaller amount of Neanderthal admixture in Europeans, compared to Asians, based on the assumption that shared Neanderthal variants present in Africans aren’t Neanderthal? I think I’ve read that some paper(s) had this assumption. Without it, Europeans would still have more, if I recall. I just finished Svante Paabo’s book on Neanderthal Man. If they found the variant in Africa, it’s not Neanderthal. Neanderthal mutated after leaving Africa. People could easily move back to Africa long after leaving and marry into the populations there. From my NatGeo Genographic study I discovered I am 2.1% Neanderthal, 2.5% Denisovan and 2% Native American. My mother was Polish and my father Danish, All four grandparents came from those countries My haplo group is HVoa. All my reading suggests Europeans should not have the Denisovan nor the Native American as both these additions are more common to people from North Central Asia. It seems the land bridge to the Americas and the Mongol and Tatar raids in areas of Poland explain quite a bit. I would like to discover more information on how Denisovan genome bits turn up in Euopean genomes there seem little research so far. I would appreciate any suggestions. Denisovan is also found in all Europeans, along with Neanderthal. The Native American has to be the results of ancient markers. We are still learning. You are a good case study though in how misleading small amounts of admixture can be. I’m also wondering the same thing because research suggests that Europeans don’t posses any Denisovan DNA, but if they actually discovered that Europeans also posses Denisovan DNA could you please provide a link for my personal research. I have a similar DNA proflie. I have British European ancestry yet from the same study found I have 2.8% Neanderthal, 3.2% Denisovan and 2% Native American ,with haplogroup J2. Maybe there are more Europeans with these genes than was originally thought. Okay so white people have more Neanderthal DNA than black people, Asians more than Mexicans, however natives (that’s me) are awesome? That’s all the I formation I have absorbed in this article.. Cheers to the author. That test doesn’t tell you and I don’t know of any conversion. I did a test from 23nd me and somehow a link directed me to this cite. How do we put our results to connect with others?